**This blog was originally posted on The Spatula Underground, a new collaborative food blog that friends and I started. This is the first in a series of installments called "Chip Tuesdays." Every Tuesday, someone will review a flavor or brand of chips. Why, you ask? Well, because ... chips are the bomb. After heading down to the optometrist near George Washington University yesterday, I walked out of the medical center with a pair of dilated eyes and a rumbling stomach. That's when I decided, well by golly, it's almost Chip Tuesday so I better get a move on and eat some chips. I went to the deli next door -- you know, the insanely bougie kind that you would only find downtown, with $8.95 paninis and $1.50 bananas that are still green. My disdain for the place was immediate. That is, until I saw their glorious rack of chips. Imagine if you will an entire wall rack filled with various kinds of chips. The exotic flavors were abundant: thai chili and lime, southern barbeque, curry, etc. My faint heart leaped for joy. 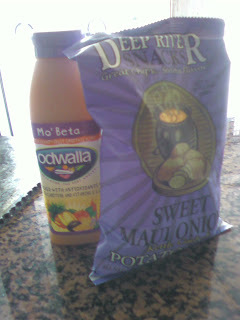 I reached for the bag that appealed to me most: Sweet Maui Onion. Purchased with an Odwalla smoothie, I was good to go. I hopped in a cab, ripped open the bag, and popped the first chip in my mouth. Delicious. Amazing. Flavor explosions in my mouth. I couldn't get enough. Sweet overtones of carmelized onion and mango, with a solid base of onion salt, wrapped around perfectly crunchy, kettled cooked chips ... it was as if I had been fed only liquids for my entire life and this was the first time in 26 years that I was given solid foods. I couldn't even bare to look the cabbie in his rear view mirror as he asked for directives. I just kept stuffing the chips in my mouth, one after another, crunch crunch crunch, mumbling the cross streets I needed to get to with my mouth still full. And then ... I stopped. You know how sometimes you just don't listen to your body? I was so hungry and enjoying the crunchy texture of the chips so much that I had completely ignored my taste buds, which, after a while, screamed out, OMG STOP! TOO MUCH! That's right folks. The romance was that brief. I went from LOVE to HATE in a manner of minutes. The flavor was so overwhelming that I almost gagged. And that's what these chips will do to you. Some bags, you can never have just one (sun chips plain, pringles sour cream and onion, kettle cooked salt and pepper), but others ... one or two is about all you can take. By the time I got back to the office, I couldn't even look at them. I felt so betrayed. Sweet Maui Onion, you were not all you said you'd be. You made empty promises. You built me up and then you tore me down. So in the trash you go. It's like I never even knew you.